Ever wonder what foods you should be eating when morning sickness doesn’t have your down? Are those cravings telling you something? Is that midnight cheeseburger bathing in ketchup good for you? What about all those banana splits? The truth is that pregnancy is a very important time to eat well. After all, a healthy mom means a healthy baby. There are some foods you should absolutely avoid, like unpasteurized cheese and foods high in mercury like swordfish. The verdict is still out on coffee. But what about chocolate? Wanting to provide an educated answer rooted in science, I decided to research the subject myself. What I found is quite interesting. Yes, it appears that chocolate can actually be beneficial to you and baby during pregnancy. Eating chocolate can help reduce the risk of the serious pregnancy complication called preeclampsia. As a brief overview, preeclampsia can be a deadly condition where mom’s blood pressure shoots up super high and her kidneys, liver, and circulatory system can collapse. Not fun at all. In the May 2008 issue of Epidemiology, Yale researchers demonstrated that mothers who ate more chocolate had a lower risk of preeclampsia. This was also confirmed by a study from the University of Iowa published in the August 2010 issue of the Annals of Epidemiology. At the University of Perugia, Italian researchers performed a trial published in the October 2012 issue of Journal of Maternal and Fetal Neonatology Medicine. 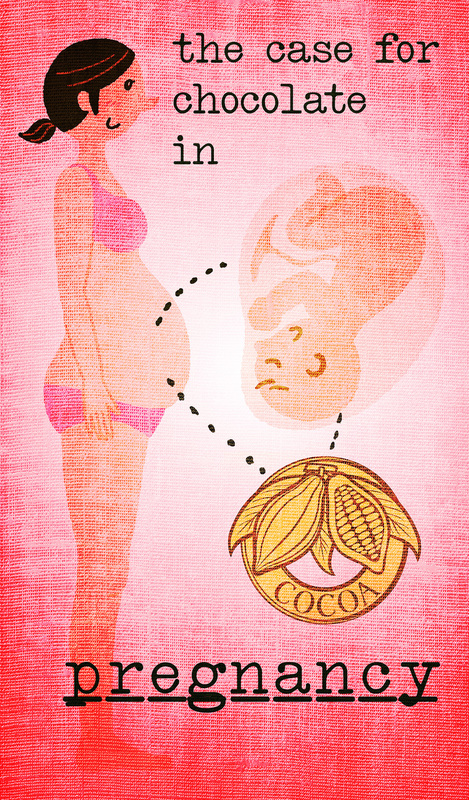 In this study, some pregnant mommies received a moderate amount of 70% cocoa dark chocolate and others did not. The lucky moms who received the chocolate had healthier liver, blood sugar, and blood pressure tests. Even more, they didn’t weigh any more than the moms who didn’t receive the chocolate. My personal favorite is a study out of University of Helsinki published in the February 2004 issue of the Early Human Development. In this study, researchers followed 305 mothers from pregnancy to 6 months after baby was born. The conclusion, moms who ate daily chocolate had the happiest babies. Sadly, stressed-out moms had babies with a more negative temperament. There is a silver lining though. Babies born to stressed-out moms who ate chocolate had a pleasant temperament. A medical literature research on the bad effects of chocolate on mom and baby didn’t turn up anything convincing. Sure, lab animals fed large amounts of chocolate in pregnancy did have some problems, but this did not hold true for humans. In fact, in 2011, the New York State Department of Health Congenital Malformations Registry reported that there was no association between maternal caffeine intake (yes, chocolate has some caffeine) and birth defects. Well, there you have it. Medical studies actually show some benefits to eating chocolate during pregnancy. Of course, this isn’t an excuse to make chocolate the center of your pregnancy cuisine. As with all health issues, be sure to talk to your doctor before making any pregnancy health decisions. Thank you again for reading and be sure to share with all of your friends, you never know who you’ll help.